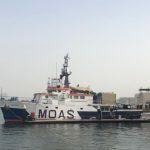 At 8 am on May 6th 2017, MOAS’ vessel, the Phoenix, entered the port of Catania, which had been assigned by official authorities as the port of disembarkation for the people we had rescued in the previous hours. On board with us there were many families and children, as well as the lifeless body of a young man from Sierra Leone who had been traveling with his brother. According to survivors, this young man died after being shot by a smuggler who wanted his baseball cap. It is unclear if the boy refused, or there was a communication problem, but it was enough to pull the trigger and kill a young man who most probably had already gone through unbearable suffering during his journey and stay in Libya. Maybe that young man from Sierra Leone thought he was almost safe; maybe he felt a huge relief thinking that after the sea crossing his life would have started in his dreamland: Europe. But a bullet interrupted his dreams of safety and pace. A bullet shot by mistake, cruelty or a lack of attention. The body of this young man lay at the bottom of the dinghy where his brother kept vigil. He finally bid farewell in the port of Catania, where a priest prayed for him before closing the coffin and driving it away to be buried. During MOAS’ SAR missions I have heard many stories of violence, but I have never become used to them. I am always shocked when I see how people kill each other in cold blood, and how the lives of some people – born in the wrong place at the wrong time- are treated with less value. It is difficult to believe I live in a world where you can be shot and die for a baseball cap. But this is not the only story I hold in my memories after our last disembarkation. 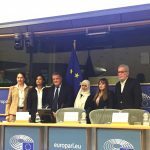 While for sure it is the one with no happy ending, I also devote special attention to the story of a Syrian family and a woman from Cameroon. Mahmood, 27, and his wife Doaa, 26, come from Damascus and had tried 4 times to cross the Mediterranean Sea in search of safety before boarding an overcrowded and unseaworthy dinghy, which was eventually assisted by MOAS’ crew. 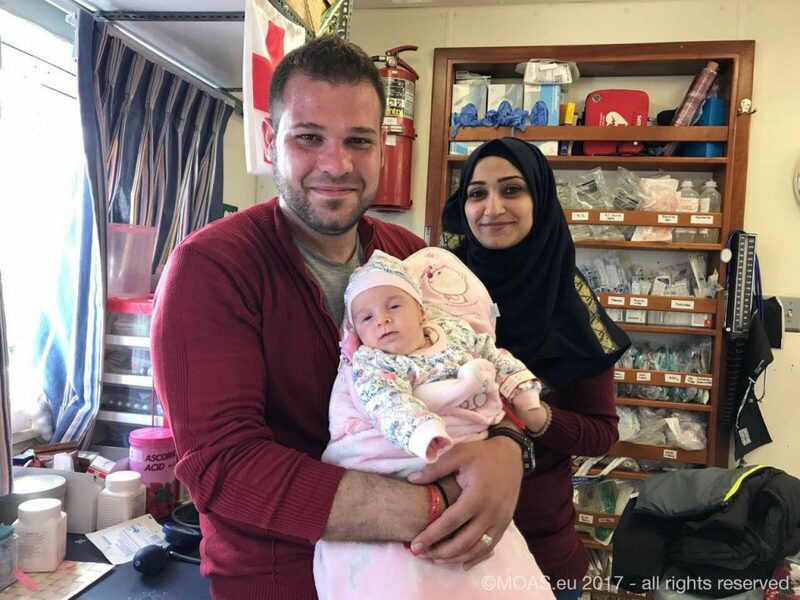 Their small daughter Rital, 2 months, was also with them after being born in Sabratha, Libya. They were both lawyers and forced by the ongoing civil war to leave their country and had to risk their lives again before arriving in Catania. Moreover, I remember Nadine, 22, from Cameroon with her daughter Hope who was only 4 months old. Her journey started in 2013, crossing Niger before reaching Libya. 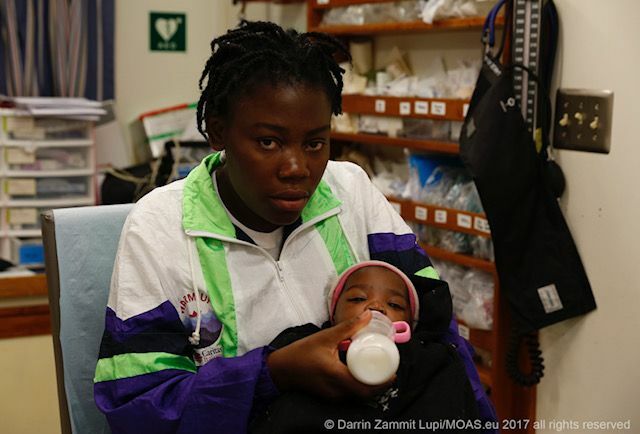 When she found out she was pregnant, her boyfriend did not want to take responsibility, but she decided to keep the baby and gave birth to her daughter in a detention camp in Libya. This very young girl delivered her daughter alone in a prison with no medical care, with nobody there to comfort her or to take care of the new-born baby. With deep emotion she tells me she cut the umbilical cord by herself and bled for weeks after the delivery with no assistance. As a mother and a woman, my pain is immense. 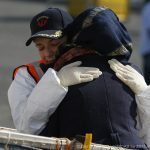 The first time she was checked by a doctor since birth the was on board the Phoenix, where our crew gave her back dignity and hope. These stories bear clear witness that NGOs operating at sea are crucial to prevent the death toll rising, particularly since the number of victims and levels of violence affecting migrants fleeing from desperate situations are already too high. None of these people should have been forced to put their lives in the hands of smugglers taking advantage of their fears. Nobody should die for a baseball cap or die in a prison with no medical support. In light of this we will never stop calling for the implementation of safe and legal routes. Humanitarian corridors are a key solution in preventing smugglers’ business from increasingly thriving and exploiting the most vulnerable people. Since August 2016, MOAS has been committed to implement them in order to prevent more people from dying at sea. Now we hope that time has finally come to put them into force.